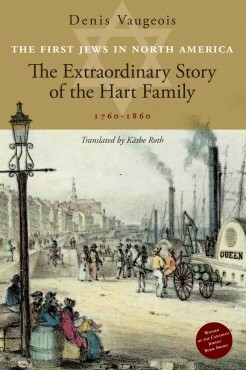 Filled with original documents and vintage illustrations, this history chronicles the lives of the Hart family—a Jewish family who settled in the French-speaking and predominantly Catholic Trois-Rivières, Quebec, in 1761. Following Aaron Hart and his descendants for a century through the political upheavals that shaped North America, this account not only bares the Jewish struggle for equality and freedom, but also delineates the contributions made by the various family members. These include the passing of the Jewish Emancipation Act in 1832 and the creation of the Hart Memorial Trophy for the National Hockey League’s Most Valuable Player. A fascinating and comprehensive read, this book breaks new ground in its examination of the Jewish experience in North America. Winner of the 2012 Canadian Jewish Book Award for History conferred by the Koffler Centre of the Arts. Denis Vaugeois is a historian, a publisher, and the author of many books on North American and European history, including America: The Lewis & Clark Expedition and the Dawn of a New Power and Mapping a Continent. He is also Quebec’s former minister of cultural affairs. He lives in Quebec City. Käthe Roth is a Montreal editor and translator. She is the coauthor with Denis Vaugeois of America’s Gift: What the World Owes to the Americas and their First Inhabitants and the translator of Vaugeois’s The Last French and Indian War. The Honourable Herbert Marx is a graduate of the Université de Montréal and Harvard Law School. He was professor of law at the Université de Montréal (1969-79), Member of the Québec National Assembly (1979-89), Minister of Justice and Attorney General of Québec (1985-88), and a Justice of the Québec Superior Court (1989-2007). He has published many articles and books on constitutional law, civil liberties and poverty law.